Aluminum Bar is utilized in automotive manufacturing, structural applications, hardware, tools, equipment and other mechanical products. 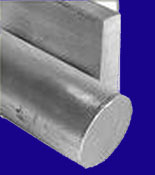 Available Tempers: As extruded or cold finished. Available Diameters: .125" to 20"
Available Surface Condition: Mill finish or extruded anodized surfaces custom produced.